We present the sixth and final part of Henri de Villiers’ article on the Lenten stations observed by the church of Paris, in an English translation by Gerhard Eger. The French original was published on the blog of the Schola Sainte-Cécile; since it is fairly lengthy, we have broken it up into six parts, each covering the stations celebrated that particular week. See part one for a general introduction. 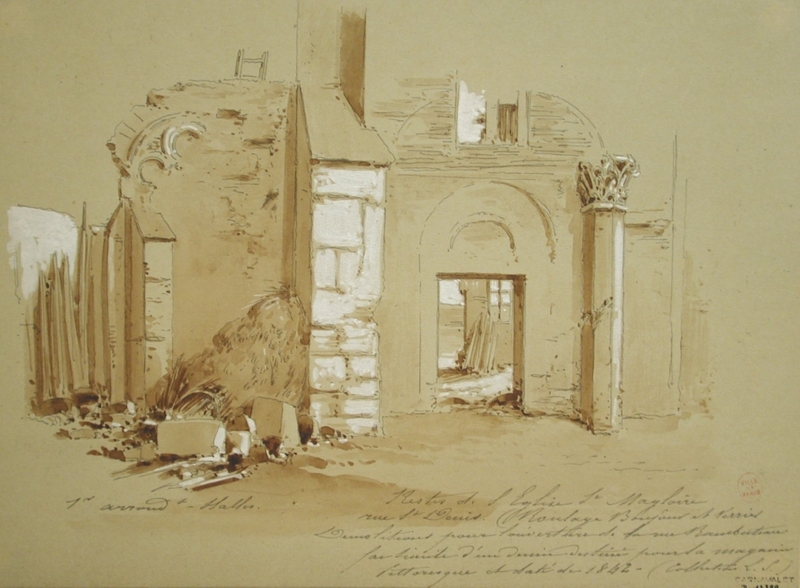 Jules-Adolphe Chauvet, the ruins of Saint Magloire ca. 1842, before their destruction under the July Monarchy to make way for the Rue Rambuteau. St Magloire lived at the end of the 6th century and was one of the many saints from the insular Britain (Great Britain) who crossed the English Channel to evangelize continental Britain (Brittany). He was born in Glamorgan in Wales and was formed by St Illtud. A cousin of St Samson, he succeeded him as archbishop of Dol, before renouncing this office in favour of St Budoc, in order to withdraw to the island of Sark and there lead a monastic life together with 62 disciples until his death. The relics of this holy man were taken from Sark to the Abbey of Léhon (near Dinan) during the reign of Nominoe, a king of Brittany who died in 851 (doubtlessly on account of the first Viking invasions). Around 910, the Vikings showed up in the region of Dinan, so the monks fled to Paris bearing with them the relics of St Magloire. With the support of King Hugh Capet, they founded a new abbey dedicated to him in the capital on the right bank of the Seine, which then became their motherhouse after the return of the monks to Léhon. In 1318, the holy body of St Magloire was placed in a magnificent silver reliquary. In 1572, Catherine de’ Medici decided to move the monks of Saint-Magloire to Saint-Jacques-du-Haut-Pas; the relics of St Magloire and his disciples were then transferred to the Hôpital Saint-Jacques, which became a convent. These relics were secretly buried during the Revolution, and were not recovered until 1835, when a new high altar was installed in Saint-Jacques-du-Haut-Pas. The old abbatial church of Saint-Magloire on the right bank (situated in what is today 82 Rue Saint-Denis) was destroyed during the Revolution. The July Monarchy tore down the last ruins of Saint-Magloire to make way for the Rue Rambuteau. Archeological excavations carried out in 1993-94 revealed the presence of a Merovingian funerary basilica built in the 6th or 7th century, mentioned for the first time in a charter of 709. An abbey attached to this basilica was founded at an unknown date; at the end of the 9th century, both were destroyed by the Normans. In 1059-60, King Henry I founded a collegiate church on the site before dying; construction was continued by his son Philip I and its dedication, in honour of St Martin of Tours, was celebrated on 29 May 1067. After the death of the first dean of the canonical chapter in 1079, Philip I entrusted the church and its lands to the abbey of Cluny, which was already present in the region with a priory at Longpont. St Hugh, abbot of Cluny, named Ursio (Ursus) first prior of Saint-Martin-des-Champs. Two bell-towers flanking the apse were erected a few years after the arrival of the Cluniac monks; the south bell-tower and the vestiges of its apsidiole are today the sole remnants of these beginnings of the priory. Saint-Martin-des-Champs quickly became one of the most important and richest priories of the order, especially thanks to the protection of Kings Louis VI of France and Henry I of England. In the beginning of the 12th century, thirty priories spread out across some ten dioceses were already dependent on Saint-Martin-des-Champs, which was styled from this time forward as a daughter of Cluny. Its domain extended even into England; according to Peter the Venerable, the number of monks at this time reached 300. At the initiative of Prior Theobald II (1132-42), who became bishop of Paris in 1143, the wall surrounding the abbey was fortified, and the construction of the splendid choir of the church—a masterpiece of the late Romanesque—was carried out around 1134 or 1135. During the rule of Prior Baldwin (probably between 1225 and 1235), a Gothic cloister was built at the north of the church. A new refectory, a masterpiece of the Rayonnant Gothic, was apparently built during this time. A fourth great work of construction took place during St Louis’ reign: a new fortified wall was erected, many towers and wall portions of which are still visible in the Rue du Vertbois. Indeed, as its name reveals, Saint-Martin-des-Champs was located outside Philip Augustus’ wall, but within that of Charles V. In 1426, Philippe de Morvilliers, the first president of the Parlemant of Paris, together with his wife Jehanne du Drac, established a funerary foundation in favour of Saint-Martin-des-Champs and endowed the church with sumptuous furnishings. Under Henry III, a monumental portal, giving access to the monastery courtyard, was built next to the Rue Saint-Martin. The construction of a Doric cloister in place of the Gothic, begun in 1702 on plans by Pierre Bullet, was finished in 1720. Most of the mediæval buildings were replaced one by one, under the direction of several successive architects, including Jacques-Germain Soufflot. The new dormitory was finished in 1742. In 1769, the church’s façade was redone in the Jesuit style by the architect Sylvain Edmé Bonnamy. During the Revolution, the priory was closed in 1790 and nationalized. It was to be transformed into a armement manufacturing factory, but a decree of 22 June 1798 finally granted part of the buildings of the old priory of Saint-Martin-des-Champs to the new Conservatory of Arts and Crafts. The church itself was not originally included in this project, but was finally incorporated on 2 April 1799. The buildings were never again used for worship thereafter. The Royal Abbey of Montmartre with the two abbatial churches, upper and lower; by Etienne Martellange,1625. The choice of this church as the final Lenten station was doubtlessly due to the fact that the Parisian rite celebrated the feast of the Compassion of Our Lady (a feast better known today under the name of Our Lady of Sorrows) on Passion Friday. 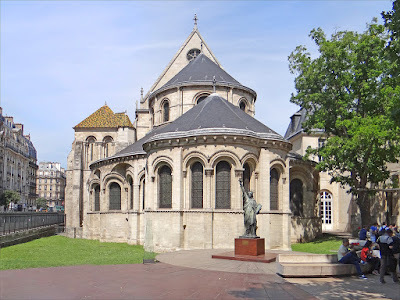 Since the 6th century at least, a place of worship dedicated to St Dionysius existed in Montmartre (otherwise called the “Mount of Martyrs”, where Dionysius, Rusticus, and Eleutherius were beheaded). Of this Merovingian basilica, five capitals and four marble columns, taken from an ancient pagan temple, survive in the present church. The basilica was ravaged by the Normans during the Siege of Paris in 885, and then by a storm in 944, but was apparently repaired after each of these damaging events. In 1134, King Louis VI the Fat decided to found an abbey on the site, in reparation for a conflict he had had against the Holy See. The preceding year, he exchanged the churches of Saint-Martin-des-Champs and Saint-Denis-de-la-Chartre on the Île de la Cité for 13 hectares of possessions which the monks of Cluny had at Montmartre: vineyards, presses, mills, an orchard, a hamlet, old ruins, a church at the summit of the mound, and at mid-slope, a paleo-Christian necropolis, as well as a little chapel dedicated to the martyrdom of St Dionysius (the Sanctum Martyrium). The church—currently that of Saint-Pierre-de-Montmartre—was then restored, conventual buildings were constructed to its east and south, and the new abbey was entrusted to the Benedictines who came from Saint-Pierre-des-Dames in Rheims. The dedication of the new church, on Easter Monday 1147, was an exceptional ceremony. It was celebrated by the pope himself, in the presence of two of the greatest religious figures in Christendom at the time, St Bernard of Clairvaux and Peter the Venerable. In 1153, Queen Adelaide, widow of Louis VI the Fat, retired to the Abbey of Montmartre. She died there a year later and was buried: her gravestone is still visible today in the nave. The Royal Abbey of Montmartre quickly became one of the most important in France. The church’s choir being reserved to the religious under the invocations of Our Lady and St Dionysius, the nave, dedicated to St Peter, was used for parish worship. A cloister was built at the south of the church in the beginning of the 13th century, and served as a cemetery for the simple religious as well; abbesses were buried in the church’s choir. St Thomas Becket passed through the abbey during his exile in France between 1164 and 1170, and St Joan of Arc did as well during the siege of Paris in 1429. The vaults of the nave and the crossing of the transept, in the Flamboyant Gothic style, were redone around 1470, when the church needed important repairs in the wake of the Hundred Years’ War. During the repairs of the little chapel of the Sanctum Martyrium ordered by Abbess Marie de Beauvilliers at the beginning of the 17th century, the workers fortuitously discovered a very ancient subterranean crypt, built into the gypsum-stone behind the chevet. This caused a great sensation, for it was thought that a paleo-Christian place of worship had been discovered, with an altar where St Dionysius himself might have celebrated Holy Mass. Pilgrimages multiplied, and Marie de Beauvilliers took advantage of this to restore and enlarge this ancient chapel in 1622, and then to begin the construction of a new priory on the side (near the present Place des Abbesses). On account of the dilapidated state of the late mediæval abbey, most of the religious ended up installing themselves in this lower priory. Thus, what had originally been intended to be a dependency ended up becoming the abbey itself. 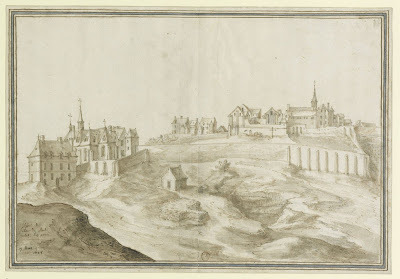 During the abbacy of Françoise de Lorraine (1657-1682), the lower abbey was attached to the higher by a long covered passageway about 400 metres long, and the former was further enlarged in 1686 using stones from the latter, which then ceased to exist. The religious now possessed a new abbatial church within the lower abbey and hence no longer had need of the upper church of Saint-Pierre, which was therefore was given over entirely to parish worship, but continued to depend on the Royal Abbey of Montmartre. A parish cemetery was created at the north of the upper church and a new bell-tower was built in 1697. In 1765, a new façade in the Neo-Classical style was placed before the old one and the nave was rearranged. During the Revolution, the Royal Abbey was forced to make a declaration of its goods in the beginning of 1790. In 1792, all the buildings were confiscated and the abbey was vacated on Sunday 19 August 1792, and then profaned and pillaged. Having been nationalized, the lower abbey buildings were sold in an auction in several lots, and those who bought them soon demolished them. Even the venerable crypt of the chapel of the Sanctum Martyrium was ruined. The upper church of Saint-Pierre escaped this fate, for it is the only parish church in Montmartre. Following the example of most of the churches which were not sold, it was transformed into a Temple of Reason after Christian worship was banned during the Reign of Terror. The last abbess, Louise de Montmorency-Laval, was beheaded on 2 July 1794 at the age of 71, despite being deaf and blind. Antoine Fouquier-Tinville condemned her to death for “having deafly and blindly conspired against the Republic.” The cemetery surrounding the upper church, the cimitière du Calvaire (opened in 1688), was vandalized. Above the choir, a tower meant to support Claude Chappe’s semaphore telegraph was built in 1794, and remained in place until 1840, the choir itself serving as the junk room. The church was not reopened for worship until 1803 or 1806, but remained in a very bad state throughout the 19th century, despite certain attempts at partial restorations. The late 17th-century bell-tower was demolished in 1864. Under the Commune, the church was again profaned and transformed into an ammunition magazine and workshop for the making of clothes. In 1876, the basilica of Sacre-Cœur de Montmartre was erected east of the chevet of the church of Saint-Pierre, partially on parish lands. All attention was focused on this new basilica, and the church of Saint-Pierre was almost forgotten. In 1890, its choir threatened to collapse, and in 1896, a section of the wall crumbled; a commission declared that it was dangerous and irreparable. It was “definitively” closed as a security measure and its demolition seemed a mere matter of time. Nevertheless, on 12 October 1897, the municipal council finally decided that the church would be entirely preserved; the architect Louis Sauvageot was charged with working out a project, which was approved by the Ministry of Fine Arts. Restoration work began on 1900 and lasted five years. The Society of Old Montmartre demanded that the church install its museum there, but Fr Marie Charles François Patureau (1853-1930) valiantly defended the use of the church as a place of worship, and was named curé on 23 February 1908.